Facebook Vs Twitter. Google Vs Bing. Manchester United Vs Manchester City (Hardly a fair fight I know, 20). And even the Star Wars Prequels Vs the Star Wars Sequels. There’s conflict everywhere but one we see every single day is Search Engine Optimisation VS Web Design. I’ll first explain why there is such a divide between the two. Functionality > Presentation. In an ideal world the whole of a site that’s ready to be optimised needs to be content rich. There can be no flash and at least an image per page. Eveything can be controlled by one plugin where you can manage all the meta and rich snippets. Everything the website needs to rank for has it’s own section, there’s a blog which is updated daily with quality content. The reality however varies wildy from this idealistic view. There are still sites that are written in static .html that makes it hard to create anything dynamic. Coding can be erratic and some sites can be hacked together where editing a single line of code can knock the whole website out of sync. You can still get website written in .aspx that is a programming language created by Microsoft, and whilst some people are still advocates of it they are finding their numbers dwindling. Presentation > Functionality. To any web designer worth their salt, a website HAS to have that extra special something that makes it stand out in front of all the other competitors websites. In an ideal world for a Web Designer, websites in search engines would rank according to how good they look regardless of their Meta titles or how many links there are to them (although from an SEO point of view a beautiful site generates links organically with friends sharing sites saying “Check this beautiful site”). Content to a Web designer would be irrelevant as surely how a site looks is the only thing that matters. So who’s right and who’s wrong? 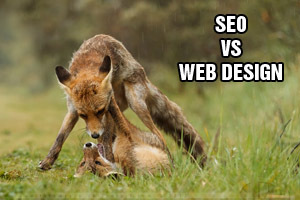 As I mentioned, the above is a snapshot of the Viewpoint of a Web designer and an SEO, it’s entirely subjective. There is no right or wrong. However I will say this. In each industry, as with all industries you do get the the good and the bad. There will be companies out there who are after a quick buck so have together a pretty decent looking website that is not easily optimised or edited, much to the irk of the designated SEO Technician who will complain whole heartedly about Web Designers. On the other side of this coin however there will be a web designer who has had one of their lovingly created websites ruined by some amateur “SEO Technician” who keyword stuffs, buys hundreds of bad links and then disappears at the first sign of a Google Webmaster warning. So in the end it doesn’t boil down to SEO Vs Web Design, it comes down to people complaining about people who haven’t done their job properly.